Whilst the 2nd Leinsters were taking part in the August attack on Guillemont, the 7th Leinsters were fighting in the trenches in Loos village when they received their orders to move to the battle area of The Somme. The general advance of the allies was to be from Beaumont-Hamel on the left flank, to Guillemont on the right. The Guillemont sector was within the command of the 20th Light Division and attached to the 20th Light was the 47th brigade of the 16th (Irish) Division. 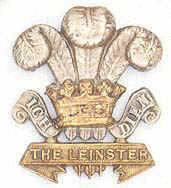 The 47th Brigade was 7th Leinsters , 6th Connaught Rangers, 8th Muster Fusiliers and the 18th Royal Irish. Passing by Bernafay Wood and the north section of Trones Wood the 7th Leinsters as part of 16th Irish brigade eventually on the 3rd September 1916, took up their positions in front of Guillemont with 'A' Company to the South East of Waterlot Farm some 300 yards (425 metres) from the German front line. The 7th Leinsters were charged with moving to just north of the village of Guillemont and waiting in the assembly trenches known as the Gridiron. From there they would attack south to occupy the village and meet up with the remainder of 47th brigade in 'Green Street'. Zero hour was midday on the 3rd September 1916 and as the field artillery commenced to lay down a barrage, the 7th Leinster left the Gridiron and moved south toward an area known as the quarries and captured the font line of the German defence. Leading the Leinster attack Lieutenant J.V. Holland's band of twenty-six bombers stormed forward clearing the German front line, but in doing so the group sustained heavy casualties being reduced to a handful of just five. For his gallantry in leading his men, John Vincent Holland was awarded the Victoria Cross. The 7th Leinsters then continued to advance, clearing their sector and eventually rendezvousing with the remainder of the 47th as originally planned. But what had been captured? The village had long ceased to exist, it was now just a tactical position on the battlefield map. The Leinsters stayed in Guillemont until 5th September 1916 when they were relieved by the 7th Royal Irish Rifles and moved to Carnoy. A day later four officers of the Leinsters were sent on detachment to the 6th Royal Irish Regiment to participate in the advance on Ginchy from where unfortunately they did not return.